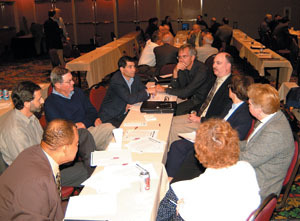 On Friday, October 22, 2004, the APSF Board of Directors’ Workshop, which I moderated, was convened at the Riviera Hotel in Las Vegas, NV. A host of distinguished speakers presented their cases in consideration of an APSF initiative regarding the use of the audible beep tone from the pulse oximeter and one other audible physiological alarm. Together with leadership from the APSF Corporate Council, 6 breakout groups debated the proposal that these be recommended as a new standard of care for intraoperative monitoring. A unanimous endorsement of the APSF initiative was obtained. Based on the deliberations of the Workshop, the APSF Executive Committee met the following day and drafted recommendations regarding audible alarms for consideration by those organizations that produce standards, guidelines and practice advisories in anesthesia. Dr. Robert Stoelting, APSF President, introduces New Clinical Alarms Initiative at the APSF workshop in Las Vegas, NV, on October 22, 2004. The workshop began with a dramatic introduction by APSF President Dr. Robert K. Stoelting, who presented testimonials regarding anesthesia practitioners who silenced all audible tones and alarms, such actions leading to the occurrence of death or brain damage. Reference was made to a published account of such tragedies as detailed by Dr. Ann S. Lofsky, member of the Board of Governers and chairperson of the Insurance Committee at The Doctors Company of Napa, CA. Dr. Stoelting pointed out that the ASA Standards for Basic Anesthetic Monitoring do not address audible tones and alarms except for one: disconnection of the breathing circuit. He charged the workshop participants to complete their deliberations with a recommendation that the ASA Committee on Standards of Care adopt a new standard for using the audible tone and one other audible physiological alarm. Dr. Stoelting then played a portion of the CBS 20/20 documentary “Deep Sleep,” recorded some 20 years ago, which is dramatically pertinent today in its rendition of horrible anesthetic disasters that went undetected for the lack of audible monitors. Dr. Robert A. Caplan, well known for his work on the ASA Closed Claims Project, and member of the APSF Executive Committee, presented new closed-claims data for this workshop that outlined the significance of the problem. Of 6,448 reviewed cases from 1970 to 2002, there were 26 alarm-related injury claims and the pulse oximeter was frequently involved. Most (88%) of the incidents occurred in the operating room and during routine surgical procedures. In 54% of the cases the alarm was turned off, while in 31% the monitor was absent or broken. In 71% of cases, the monitor was on, but the alarm had been turned off. In an additional 29% of cases, both the alarm and monitor had been turned off. Of the 26 alarm-related injuries, 88% resulted in death or brain damage with a median payment of $449,941. In 5 out of 7 claims since 1990, the alarm was either turned off, or the audible tone was turned off at the surgeon’s request. Dr. Caplan pointed out that, statistically speaking, the alarm-related injury was an infrequent problem, but it carried a large liability. He emphasized, however, that the next increment of statistical benefit to our patients would be achieved with the use of the audible tones and alarms from SpO2 and EtCO2 monitoring. In other words, if both the monitors and their audible tones were used, the percent of cumulative mistakes eliminated would increase from 31 to 88%. We were pleased to announce the next speaker, Dr. Thomas Lavell, representing the JCAHO. He immediately addressed the decision by the JCAHO to rescind its 2003 National Patient Safety Goal to “Improve the effectiveness of clinical alarm systems,” an explanation of which was published at: http://www.aami.org/publications/AAMINews/2004September/0904.jcaho.html. Dr. Lavell stated that within the JCAHO, there was a competition for goals, that the above goal did not disappear, but was rather transferred to another category which could still be graded during a site visit. Dr. Lavell indicated that important considerations behind the recommendation for alarms should include 1) the criticality of the situation, 2) the meaningfulness of the information provided, and 3) the response of the clinician to the alarm. He emphasized the importance of redundant alarms to improve the sensitivity of detection, and the importance of training ALL staff to recognize an alarm. He gave us good advice on how to analyze our own near-misses. Dr. Lavell encouraged and described the benefits of retrospective analysis and multidisciplinary teams. He explained that root-cause analysis end products were expected along with plans for strategic response to prevent recurrence. He also highlighted the importance of monitoring any new systems-based process to ascertain whether the problem was solved. Dr. Lavell commended our society for convening this workshop, and stated that such efforts could lead to elevation of this prior National Patient Safety Goal back to high priority. Breakout groups consisted of members of the audience and included representation from APSF, ASA, AANA, JCAHO, SCCM, ACS, CCCE, and our corporate sponsors. Our next speaker was Dr. Julian Goldman, a member of the APSF Committee on Technology and coauthor of “Pulse-OX Tone Conveys Vital Information” with Dr. Fred Robertson (APSF Newsletter 2004;19;20,23). Dr. Goldman defined the problem as a lapse in vigilance causing a preventable adverse event. He described well-recognized problems with alarm systems including false alarms, nuisance alarms, competition for attention, and inopportune alarms such as those during resuscitative efforts. Goldman emphasized the intuitiveness of “sonification” of an alarm, using the example of a Geiger counter, and described the robust information on rate, rhythm, saturation, and perfusion that the pulse oximeter tone provides. He then raised the “more-than-semantics” question as to whether the pulse oximeter sound was a tone or an alarm, and ventured to state that indeed it could be defined as an alarm. However, as such, it has limitations in sensitivity to hypotension, for example. Dr. Goldman stressed that a common goal should be to improve the sensitivity of clinically useful alarms, and the elimination of false alarms. Such improvements could reduce lapses in vigilance, as clinicians rely more heavily upon their alarm systems. legal implications of requirement that ancillary personnel hear the tone; does that make them liable for the patient outcome? Despite these numerous considerations that the groups brought forward, all unanimously endorsed the APSF initiative to recommend that a new standard for the use of the pulse oximeter tone be promulgated. Following the group sessions, Walter Heuhn, APSF Corporate Advisory Council representing Philips, spoke on Smart Alarm technologies. Existing and future technologies might include escalating tones or colors in the absence of clinician response. Smart alarms could bracket existing vital signs with either wide or narrow limits. Artifact rejection might recognize an arterial spike secondary to line flush, or dampening of the wave secondary to cuff inflation. A user might switch to profiles that define cardiopulmonary bypass, for example, which could temporarily suppress certain alarms. Other predefined events could trigger a higher resolution of data capture. Horizontal nominal displays could graphically depict an abnormality with deviation bars above or below the baseline. Mr. Heuhn emphasized, however, that true smart alarm technology would lead to analysis of integrated data, diagnosis, and decision support. Representing the ASA Section on Professional Standards, Dr. Jerry A. Cohen as chairman, stated that a pulse oximeter beep tone could well be considered an alarm, defined as a signal that brings information about a change in condition. Creating new standards is hard work, said Dr. Cohen, since it requires wisdom and consensus to word such standards with simplicity, brevity, and definition. Using analogies to aviation, Dr. Cohen spoke highly of alarm systems which use voice technology to warn of dangerous or impending abnormal conditions. He stated that it was much easier to pass standards for binary alarms (those which give yes/no information) than it was to pass standards for alarms for exceeded ranges. Regarding alarm suppression, he commented that continuous intervention at cancellation should be required by the clinician. Passage of the APSF initiative was “imminently” do-able for several reasons, Cohen said. We have 20 years of experience and familiarity with it; it is a continuous monitor; and he considers it to be a binary (good/bad) alarm. Dr. Jack L. Moore, chair of the ASA Committee on Standards of Care, concluded with the briefest and probably the most profound of all the presentations. He commended organizations such as the APSF because they are committed to high standards and as such, are valuable resources to the Committee on Standards. Moore stated that our workshop provided just what his committee needed to advance such standards; that those standards should apply to all anesthetics, not just those in the operating room; and finally, a resounding “YES,” that the ASA should adopt further standards regarding the audible tone of the pulse oximeter. In concluding remarks, Dr. Robert K. Stoelting said that he heard a consensus from the entire workshop and its speakers: the pulse oximeter tone has unanimous support with some caveats. He recognized greater difficulty in getting consensus on the additional standard for at least one other audible physiologic data alarm. He thought that we should not specify who in the operating theater is required to hear the tone. Although we should be flexible to evolving technologies, Stoelting said, we should still address our current technology now and change the standard in the future, as needed. “When the pulse oximeter is utilized, the variable pitch pulse tone and the low threshold alarm must be audible. To date, APSF is aware that committees in the American Society of Anesthesiologists and the American Association of Nurse Anesthetists are considering these recommendations. Dr. Michael Olympio, MD, is a Professor of Anesthesiology and Vice Chair for Education at Wake Forest University School of Medicine. He also serves as Chair of the APSF Committee on Technology.